Dina and her Heathen Horde have joined our blogroll. 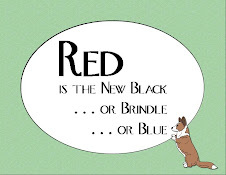 It's all about living with red cardis. She has Scout's grandpa big red Sam and sister Moira. Stop by and say hey! Sigh. Tried to welcome her, but was booted despite all of my access attempts. I think she needs to check her settings. Well, that's just odd. I will check settings although that may prove fruitless since I am not all that tech savvy. My Google account let me post a hearty howdy to her. More of the red dogs -- you are all way too brave for me.